A Possible Time Warp in the Gardens at Houmas House?? 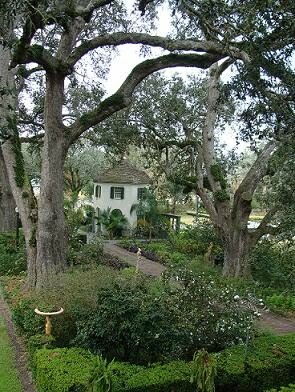 Once we completed the tour my husband and I enjoyed lunch at the Burnside Cafe, which is in an out-building at Houmas House. Before leaving we spent some time walking around the gorgeous gardens that Mr. Kelly has filled with beautiful foundations and Greek and Roman statues. This is a picture I took of the area of the gardens known as “The Secret Garden.” This is in the front of the property along the road that leads up to the house. While still in the house I took a picture of a quaint side-building from the 2nd floor balcony. I wondered what it had been used for, but forgot to ask our guide. Now I wish I had! During our walk we came up to it. I wanted to see what was inside so I stepped up to the door that had paned glass in it and looked through it. All I saw was a delapitated interior. There were no furnishings. The walls looked like they had been stripped as though the building was being prepared for renovation. There was also a large unfinished artist’s canvas propped up against a fireplace along the opposite wall. Our guide had said the head gardener was an artist so I assumed they had yet to renovate this building and the gardner was perhaps using it for storage. I walked off and thought nothing of it. Now I deeply regret never having taken a picture of what I saw! To this day I have no idea what happened. I have shared this experience with Mr. Kelly, but by then I figure he was freaked out over the ghosts that showed up and he never responded to that email of me asking him if that building truly has been renovated and turned into a bar or if those pictures had been a mock-up for the Internet and he had not yet carried out the renovation. However, if you read the page (link is below) it appears that the bar is in existence. If that is the case, then what in the world happened to me? How was I able to walk up to a door, look inside and see an old delapitated ruin of an exterior if it’s a nice bar today??? Also, if it is a bar, wouldn’t there have been people around??? I saw no one. I am left to wonder did I slip back in time (I was visible to my husband the entire time, but he himself never came up to look in the windows like I did so I have no witness to collaborate what I saw) to see the interior before its renovation? Perhaps I saw a ghostly image of what was once there. If so, was the bartender inside looking out at me wondering what this crazy woman was doing peering in through the door? I walked off thinking absolutely nothing of this experience. 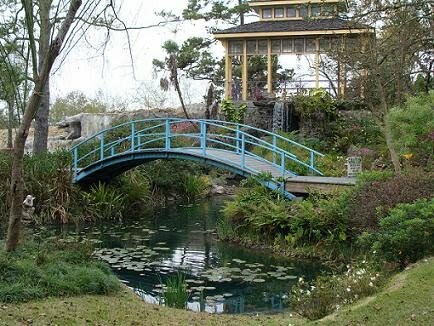 My husband and I very much enjoyed our walk through the gardens. We “oohed” and “ahhed” over many things and took pictures at the replica Japanese Garden, shown here on the left. We walked up to the top and from there had a good view of much of the garden below. The tour of the home was more than I had hoped for as we were taken through the house and even allowed to take pictures. 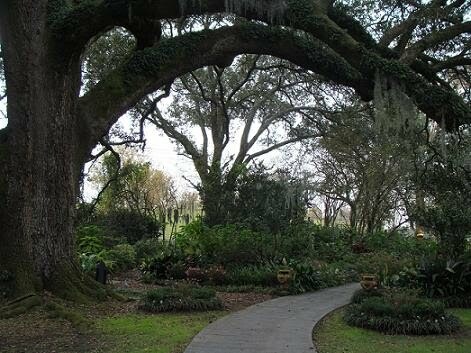 The gardens are breathtaking and if we ever are in the area again I will definitely schedule a return trip to Houmas House. I strongly urge you to take a side-trip here should you visit New Orleans. It is an hour away by car and well worth the detour! 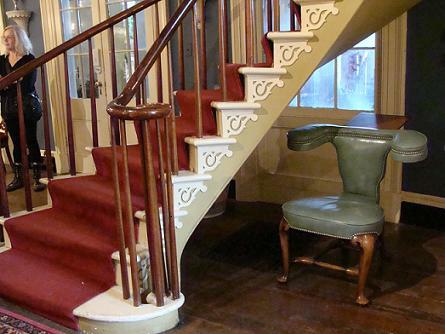 It also has what used to be a free-standing spiral staircase. 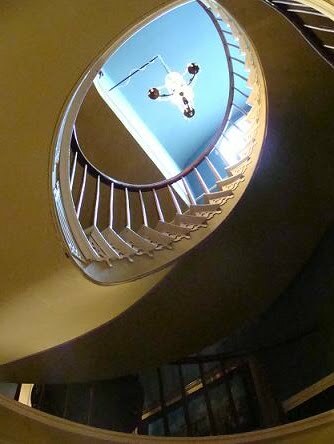 Mr. Kelly had a wall built to cut a large room in half so now the staircase is against one wall, but our guide told us that to this day, architecture students make special trips to visit Houmas House in order to study the spiral staircase. And, yes, during the tour you do climb that staircase. Here, you can see the bottom of the stairs. Next, is a view looking almost perfectly straight up to the top from the first floor. And, no that blueish thing is not an orb. It’s merely a reflection caused by the sunlight. The link to the page about the Turtle Bar is here.